Venice said NO to OPDs in the Venice Coastal Zone at the June 11 Coastal Commission Meeting and the Coastal Commissioners listened! The California Coastal Commission rejected the City's Venice Coastal Application to create OPDs, which is permit parking system being used to remove homeless people living in vehicles from many areas throughout the City of Los Angeles. The OPD law, LAMC 80.54, is a permit parking program that is enforced only between 2AM and 6AM. Only people who qualify as a "resident," as defined by the rules of the OPD law, can purchase a permit. Also disabled plates are not exempt from this law. This is how the City and the NIMBYs remove RV Dwellers from a neighborhood. The mainstream press has been covering the Venice RV and OPD issue routinely from the side of proponents of OPDs, but many Venice residents do not want the OPDs. Beachfront rental property owners, disenfranchised walkstreet residents, business owners, homeowners, renters, and RV dwellers all came together at the Coastal Commission meeting to show opposition and state how the OPDs would adversely affect them or others. Venice people do not want this permit parking program for a variety of reasons, which they proved by providing an incredible amount of public testimony that seemed like it would go on forever. A parade of more than a hundred concerned Venice personalities stepped up to the microphone and most spoke against OPDs. The Coastal Commission Staff was forced to stop accepting speaker cards. 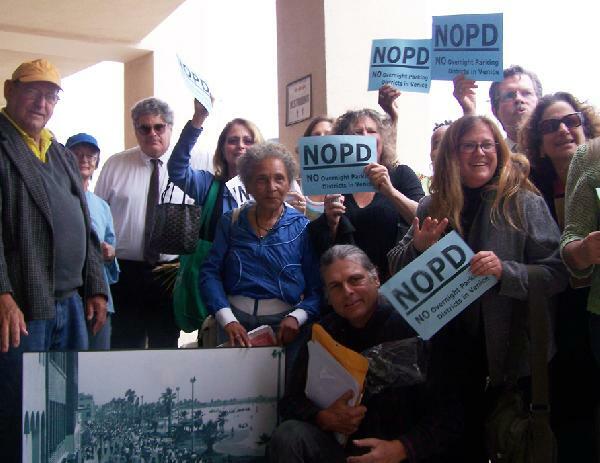 Home owner, John Raphling spoke compassionately and pointed, â€œWhere will they go!â€� knowing well that the OPDs would drive homeless people living in vehicles away from Venice and away from vital and life essential services provided in the Venice Coastal Zone. The organizations that have actively opposed OPDs are the Venice Justice Committee and Media Group, Venice Food Not Bombs, Venice Town Council, Venice Community Housing Corporation, Venice United Methodist Church, Los Angeles Coalition to End Hunger and Homelessness, Free Venice Beachhead, Venice Arts Council, National Law Center on Poverty and Homelessness, Public Counsel Law Center, and the American Civil Liberties Union of Southern California. Ultimately, the Coastal Commissioners were being asked to deal with homeless issues in Venice by approving an overnight permit parking program. The Commissioners voted 9 to 1 (with 1 abstention) to deny the Coastal Permit Application for the Venice area OPDs. Even though it was prohibited to clap during the Coastal Commission meeting, a spontaneous road of clapping and cheering occurred. People hugged each other and gave thanks. People singing Pete Seeger's "We Shall Overcome" could be heard that day in Venice.